A massive 7.9 magnitude earthquake struck New Zealand last weekend, leaving these poor, poor cows stranded. The ground around them simply disappeared. 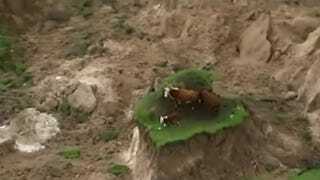 It’s unclear if the cows were rescued after being spotted by a helicopter. So if you find these cows, please give them a hand. They need it.